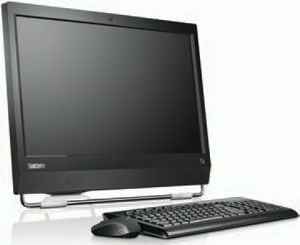 The ThinkCentre all-inone features a sleek and efficient design with a fun touch-screen option. Quality and Effectiveness: With its huge 23-inch LCD screen with multi-touch capability and its Intel Core i5 processor, this desktop is just plain fun, and its two-gigabyte memory (expandable to four gigabytes) can keep up with all the graphics, audio, and multitasking that can take place in a classroom. It has all the essentials of a desktop combined with the mobility of a laptop, especially as it also has an optional wireless keyboard and mouse. There is even a convenient carry handle on the top. This desktop brings all the bells and whistles; it has six USB 2.0 ports, two PS/2 ports for keyboard and mouse, a serial port, an “Integrated display port,” VGA input, and ports for headphones and microphone. All these controls, however, are located on the back of the unit, where they are sometimes difficult to reach. There are DVD -drive and memory- card slots and Wi-Fi and Bluetooth connectivity. The model T&L tested had Windows 7 Professional installed, so it also had the Lenovo ThinkVantage Tools, including fingerprint reader, SimpleTap, and System Health and Diagnostics, and really slick backup, recovery, and restore tools. Ease of Use: For those who are comfortable with interactive whiteboards, the touch-screen feature will be a snap. It is pressure-sensitive, so anything can be used to tap the screen to left- or right-click and to resize, rotate, or move objects. A math-input panel even recognizes numbers and mathematical symbols. Software includes Microsoft Office Starter, the full suite of which is available for purchase, and a fun set of activities for the touch screen called the Microsoft Touch Pack. Although the M90z’s appearance is clean and modern, some of the controls may be difficult to use in close quarters; the touch-sensitive controls on the frame can sometimes be a bit too sensitive; and it would be nice to be able to see the ports and slots, which are located on the back of the frame. The computer cover is easily removed for upgrades and servicing and can be locked for security. Since the unit is serviced so easily, the PDF manual presents step-by-step instructions for replacing parts and servicing. Creative Use of Technology: This computer is all about energy efficiency and ease of use. It is constructed of 41.8 percent postconsumer content (the equivalent of 65 plastic bottles) and even comes in a reusable tote bag instead of plastic wrap. It is certified by Energy Star, and each unit purportedly cuts electricity consumption by as much as 69 percent, saving almost $55 in energy costs. Either by pushing the SimpleTap button or by using two fingers to tap the screen, the user can quickly change commonly employed settings. The 2MP camera opens easily from the SimpleTap panel, and it can be shut for privacy; the user can adjust the volume and put the computer into sleep mode or lock it. Likewise, the mics can be muted with a simple tap. Suitability for Use in a School Env ironment: Although this is another PC that was designed for business, some of its features are ideal for the classroom. The large, clear display will stay clean, since the screen can be washed with cleaner safely. It connects easily to a projector, and controls for output send the image to a desktop, a screen, or both with just a tap. The VGA port permits input from another computer, and the viewing area can be doubled by connecting an additional monitor; the touch panel on the monitor’s frame controls the input. An optional fingerprint-recognition program is available for increased security. And the M90z’s slim, compact design allows it to fit easily in tight areas. The touch screen alone makes this an ideal tool for classroom use, for interactive-whiteboard demonstrations, and for use by students with disabilities that make it difficult for them to handle keyboards and mice. Although the computer has several features that enable it to lend itself to the classroom environment, the price would probably be prohibitive for most schools. We hope that it is a sign of things to come, since this is just the kind of technology that is needed in a school environment.